From performance to precision and from durability to convenience, these advancements deliver high-efficiency seeding Enhancements for 2018 help ensure the Case IH air seeding product line continues to lead the industry in productivity and agronomics. The Case IH Precision Disk 500T single disk air drill features unmatched manoeuvrability for high-efficiency seeding. The Case IH Precision Disk 500T single disk air drill features an on-board mounted 70- or 100-bushel tank with seed metering, four-section overlap control and unmatched manoeuvrability. New for 2018, producers can add tank-mounted weigh scales. Tank weighs are accessible through the Case IH Advanced Farming Systems AFS Pro 700 display or other compatible displays. A display on the rear tank platform also provides on-the-go weight readouts. 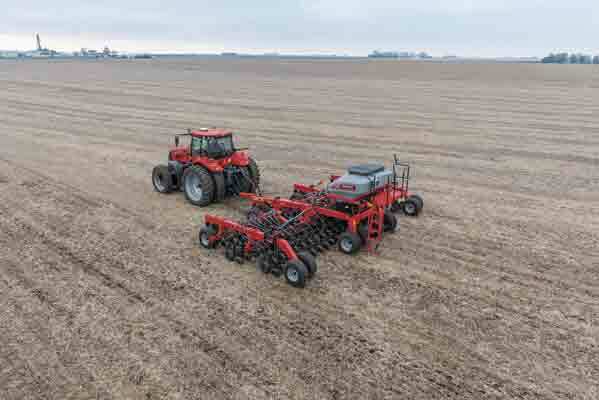 For high-capacity air seeding, the Precision Disk 500 air drill and Case IH Precision Air 5 series air carts lead the way. Tow-behind or tow-between configurations and capacities ranging from 350 to 950 bushels form the perfect match for today’s larger drills and higher-horsepower tractors. Precision Air 5 series air carts feature an innovative modular metering control system that accurately places seed and fertilizer. The air carts also feature an AFS AccuSection modular metering control system for more efficient crop input use. An optional wireless flow blockage monitoring system — available for the Precision Disk 500, Flex Hoe 400 and Flex Hoe 700 air drills — uses acoustic sensors to “listen” for the sound of seed and fertilizer flow.